The Steam Donkey was a changing point in the local logging industry bringing the moving power of the steam engine where manual labor was once required of man and animals. Both logger and mule could do more and rest easier after a day’s work. It is by no accident that, in our modern time, the name Steam Donkey has been given to the first Brewery in Aberdeen in over 70 years. Jon and Stefanie are not beer snobs. They enjoy both the traditional and the innovative, but much like opening a brewery in Grays Harbor, you have to give a nod to the past in order to appreciate the present and look to the future. Jon, the former Marine and current firefighter, wears the rubber boots. Stefanie, the former dancer and current thespian, wears the high heels. Barley, their Great Dane Lab is always underfoot. And, by the way, naming your dog after brewing ingredients might be a sign that beer is going to play a major role in your future. 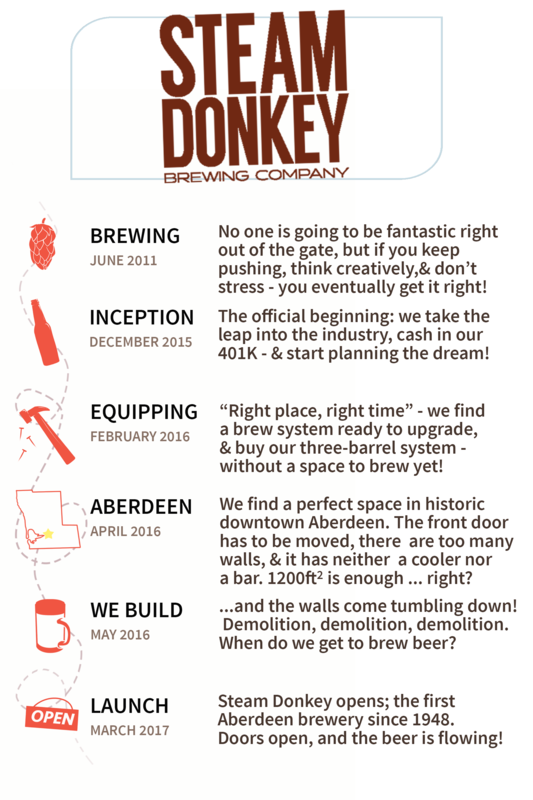 Steam Donkey focuses on brewing relaxed and inquisitive beer in a friendly environment. The bar is open to brewhouse to openly share our passion for beer and welcome curious spectators.